Snails are gastropods that have wide, a muscular foot, a head with eyes, a mouth and tentacles. This snail, Trepospira Depressa, has a flat, spiraled shell, with ornamental whorls. You will enjoy adding these Pennsylvanian age, approximately 286 to 325 million years old, snail gastropods shell fossils to your collection. 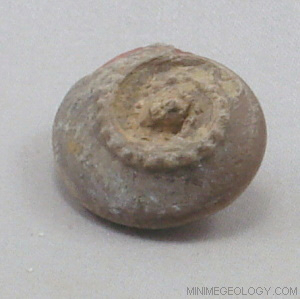 These fossil snails are from McCulloch County, Texas. Gastropod snails form a single, coiled shell with no interior chamber so that they may live in the entire interior space. The shell coils form around an axis giving a spiral shape.